For some reason the online forum hive mind has turned against GTA IV since not long after its release. It’s true that it’s smaller than San Andreas; that the missions generally follow an established formula; that Niko’s transformation from never wanting to kill again to… uh… killing again is about as convincing as Anakin Skywalker’s fall to the Dark Side; but I stand by every word of the praise that I heaped upon it back in the first few days of release. It may be far from perfect, but the fact remains that I had more fun tearing around this next-gen Liberty City than I did almost any other game this year. It’s the first GTA that held my attention long enough to finish the main story – all 40 hours of it by the time the end credits rolled for me – and I had a great time almost the whole way through. I’m obviously not expecting any revolutionary changes to the gameplay in the upcoming DLC, but there are kinks that can be worked on, such as the pressing need for mid-mission checkpoints to avoid those moments when failing a mission necessitates another drive all the way across town, and the personal relationships that could be cultivated in the game could get annoying after the first few hours, but it doesn’t change the fact that Liberty City was a joy to explore. It proved that GTA doesn’t need the increasingly outlandish missions and plot twists that typified San Andreas’s government conspiracies and cult compounds. It might have been funny, but was flying a VTOL jet over Area 51 69 really in keeping with the rest of the series? 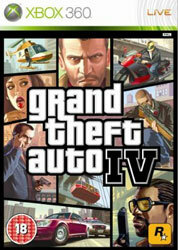 So don’t listen to the haters: GTA IV is and always has been one of the best games of 2008. Time will prove me right on that one.